STI brought its best and brightest to the Philippine Stock Exchange Plaza in Makati City to take part in marking another milestone as STI Education Systems Holdings (STI-ESH) formally listed with the Philippine Stock Exchange on November 7, 2012. Ms. STI 2012 2nd Runner-up Joressa Babanto from STI College - Muñoz-EDSA led a moving invocation at the opening of the listing ceremony, which was immediately followed by a breathtaking performance from the STI College Olympians Pep Squad. Also proving that STI provides well-rounded education and holistic development for its students, YouTube sensation and homegrown music talent of STI College -General Santos Zendee Rose Tenerefe took the stage and mesmerized the tradesmen and honored guests with a special song performance. Hosting the ceremony is Magic 89.9 disc Jockey and courtside reporter Jessica Mendoza who graced the trading floor with her charming and lively persona. The listing ceremony was concluded with the ringing of the opening bell, a time-honored tradition at the Philippine Stock Exchange that signals the beginning of each trading session, and now a symbol of achievement for the STI community. A press conference was held right after the listing ceremony wherein STI President and CEO Mr. Monico V. Jacob announced the plans to upgrade nine STI schools in different parts of the country to full-blown campuses and acquire new properties for STI's expansion program. The nine STI schools are located in Caloocan, Cubao, Ortigas-Cainta, Calamba, Lucena City, Cebu, Davao, Las PiÃƒÂ±as, and Cagayan de Oro. 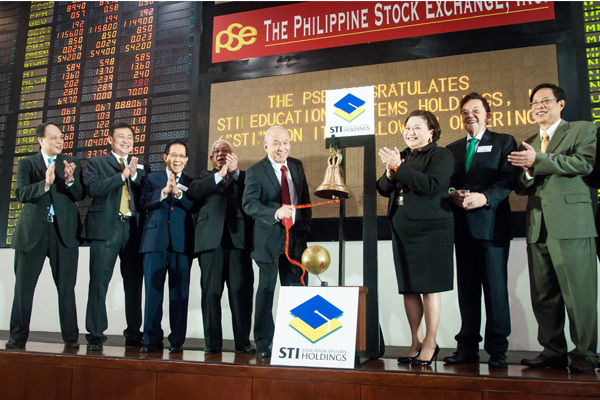 With its Philippine stock market launch, STI opens a new chapter as it opens its doors to new investors to help make real life education more accessible to students from different parts of the country and encourage more young Filipinos to achieve their full potential. Images courtesy of The Philippine Stock Exchange, Inc.